Cats can act submissive for many reasons, especially around other cats. Cats can't talk, but their body language speaks volumes. Recognizing when cats feel submissive is particularly useful because it illuminates their dynamic relationships with other animals in novel situations. Would-be cat clairvoyants take note: behavioral overlaps muddy their mute vocabularies, so you must cultivate a fine eye. A cat's ears, tail and body are her primary tells. A submissive cat turns or flattens her ears. She lowers her tail, and may even tuck it between her hind legs. She crouches low, but neutral. If she's moving, she may just have the flattened ears and lowered tail, and most likely crouches or lowers her head. Submissive cats may avoid eye contact, and occasionally lie on their back, belly up, as if to offer vulnerability as proof of acquiescence. When she greets a feline friend or foe, a cat's physical vocabulary is similar, if slightly modified. 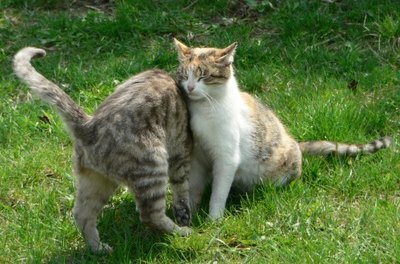 In a friendly greeting, the cat that initiates a cheek or head rub is probably the more submissive of the pair. In a not-so-friendly greeting, cats may display aggressive behavior, arching their backs and raising or flicking their poofed tails. After they've sized each other up, the more submissive cat may lower her body to the ground and thump her tail or lay prostrate on her back, perpendicular to the other cat. Cat body language changes quickly. Even when a cat is on her side or back -- usually the ultimate sign of submission -- she may raise her paw. If you're petting the cat, she may be getting ready to paw at you, playfully or otherwise. A cat in transition between states may open her mouth, gurgle a growl, flick her tail and begin making wide-eyed eye contact. These are signs of an impending mood shift. The body language of content and angry cats mirrors several facets of that of submissive cats. An on-the-back roll can be a sign of a relaxed, happy cat, or even of a cat planning a counter attack. Watch for a raised paw, which denotes the latter. A cat crouch can be preparation for an attack. Watch for the telltale flinch or tail flick that heralds a pounce. A cat also flattens her ears when she's irritated or angry. When Cats Meow Are They Talking to Other Cats? What Does Cat Acne Look Like? Do Cats Need to Be Bathed? What Does it Mean When a Cat Is Lying on Its Back? Why Do Cats Hiss At New Kittens or Cats? Why Does a Cat Flop Onto Its Side?